People are polluting our city! Macao and the world are at risk of becoming a waste landfill! Let’s join forces to go on a Rescue Mission! Eco and Hero joined together to form an Eco-Hero team to help manage waste produced all over the world. They will teach you how to manage your waste production by showing you how to apply the 4R Principle “Reduce, Reuse, Recycle and Repair” in your daily life. They will teach you how to buy only what you really need, making full use of it and how to place it in the right waste recycling container when it has no use any more. In the end, they won´t let you forget to Repair what you have broken so you can keep using it! 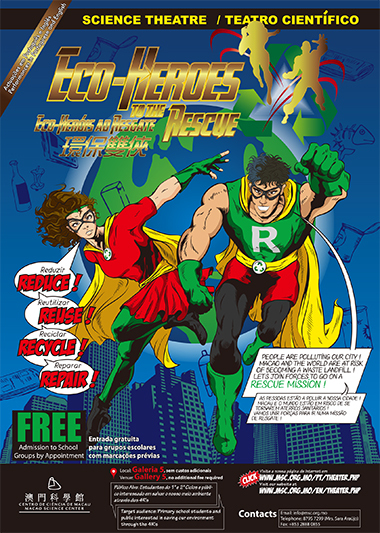 Do you want to be an Eco-hero to? Then come see our Eco-heroes and help them protect Earth!